These pedestal-mounted units are widely used across North America for safe, secure access to mail and package delivery 24 hours a day by multiple residents in one central location. 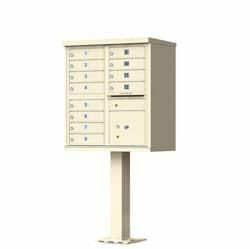 Centralized mail delivery equipment can be in the form of any "clustered" style of mailboxes, but the most popular is the free-standing, pedestal-mounted cluster mailbox or Cluster Box Unit (CBU). These USPS Approved units are most often used in outdoor new residential construction installations, but are also popular in commercial and retail settings. 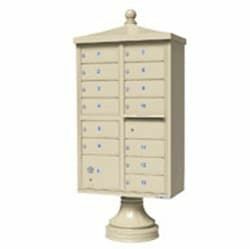 These pedestal-mounted units are widely used for safe, secure access to mail and package delivery 24 hours a day by multiple residents in one central location. Dress up your basic CBU with decorative accessories in two distinct styles to fit your neighborhood. Continued growth in online shopping means providing ample parcel locker space for package delivery is more important than ever! Expand your resident's ability to securely receive packages by adding matching outdoor parcel lockers (OPL) to your new or existing centralized mail delivery installation, or create a standalone package center. Florence is proud to be the only manufacturer to offer six USPS Approved CBU models and two decorative accessory styles. With up to 16 locked compartments, plus up to four integrated parcel lockers, and a secure outgoing slot convenient for mail collection, preconfigured free-standing cluster mailbox equipment is the perfect solution for your neighborhood. These fashionable snap-together accessories place the final touches on your centralized neighborhood mailbox; choose from Classic or Traditional style to fit your surrounding area. 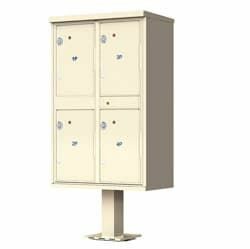 Expand your residents’ ability to securely receive packages by adding matching outdoor parcel lockers (OPL) to your new or existing centralized mail delivery installation, or create a standalone package center.